The two friends worked together at the Calvert City plant, Westlake, for a maintenance contractor. Keith is a boilermaker, John is an operator. The duo's talents mixed well in serving their employer's goals. They were also well suited for the distilling business. They experimented with building moonshine stills in a small shop on John's farm and then began selling them to distilleries. The stills are old-fashioned in many ways. They are all handmade by John and Keith who hammer the copper sheets, forming and welding them into the final product. The control panels are computer-controlled touch screens, adding consistency and ease of operation to an old process. "We got out there and got some sales for building equipment," says Keith. "There are eleven distilleries now running with equipment we built for them." John and Keith, keen on quality control, tested stills and equipment before sending them to customers. That meant crafting their own moonshine recipes and putting the stills to the test. Their products stood out due to their high quality. John and Keith used all-natural ingredients and flavorings for the flavored moonshine. And you won't find any artificial colors in their liquors. "While we were building those stills, we were creating the spirits we liked," adds Keith, "and a lot of other people liked that. They told us, 'This is what you need to be doing.' And we loved doing it. Experimenting was the fun part of it all. That hooked us on it. Just playing around over at John's barn was great." "Now there are distilleries using the recipes we created," says John. "We developed one for a place in Texas that makes cactus moonshine from prickly pear cactus." As the pair listened to the encouragement of friends and family and saw the success of their clients, they finally decided to go into the moonshine business. The original plan was to make moonshine and later aged spirits in the same place where they built their stills, distributing it to liquor stores across the state and beyond. They caught wind, however, of a coming change in Kentucky state law that would allow distilleries to sell their product by the drink. They knew then they would need to be in downtown Paducah. 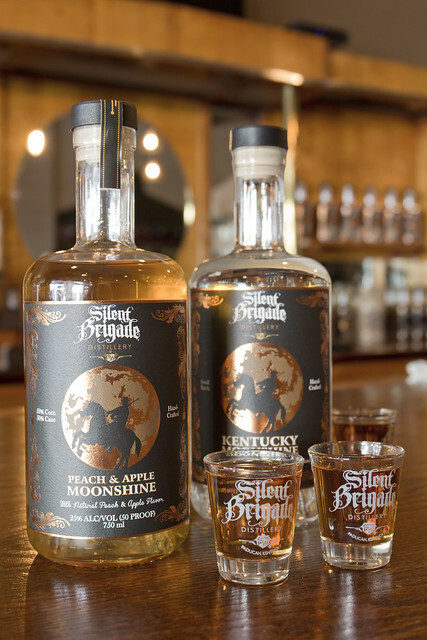 John and Keith secured the building at 426 Broadway and began distilling under the name Silent Brigade Distillery, a name pulled from their love for history and particularly the story of the Night Riders of the Black Patch. They built an environment with an aura from another era complete with a 1930s art deco bar from Cleveland, Ohio. "Making drinks with our products at our own location here on Broadway will be the other side of our production line," says John. "Moonshine can have a bad reputation. And there is a lot of bad moonshine out there. We want to change people's minds and show them there is good moonshine. And it can be used in your mixed drinks just like anything else. Plus this will be a place to hang out, enjoy some music with friends, and experience what we have to offer. 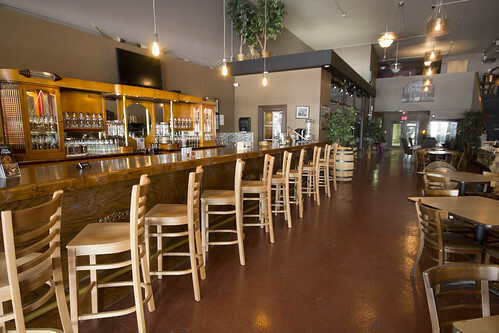 We'll have some good, craft cocktails and live music." Moonshine is only part of the equation, however. Their goal is bourbon. "We're getting all of our moonshine inventory built up because that's what will pay for making the bourbon. So everything is dedicated to moonshine now. But soon, we'll start filing up some bourbon barrels." John and Keith are proud to bring their tradition to downtown Paducah. "This is a handcrafted product," says John, "made in our own 300-gallon copper still with our own recipes. We run it slow and do a cold fermentation, which is a little different. It turns out good. And this is just what we were doing for us and our friends. We want to recreate that here. Friends are hanging out, drinking, and having a good time."